It takes guts to put a new spin on a classic, no matter where you are. But it takes serious guts to do it in the Northeast, home to some of the most passionate food debates in the country. Pat’s or Geno’s? The best slice in Manhattan? Should a lobster roll be made with mayo or butter? Simply put, this can be hostile territory. But these 10 eateries didn’t hold back. Instead, they reimagined regional specialities in ways so creative, a few sparked debates of their own. Check out their stories below and start mapping out your road trip; you’re going to want to taste these invigorated icons. Czechoslovakia always had a cosmopolitan mixture of its neighboring states. Gowanus, Brooklyn never had to deal with the communists, but it is surrounded by micro-neighborhoods with strong identities both municipal and ethnic. 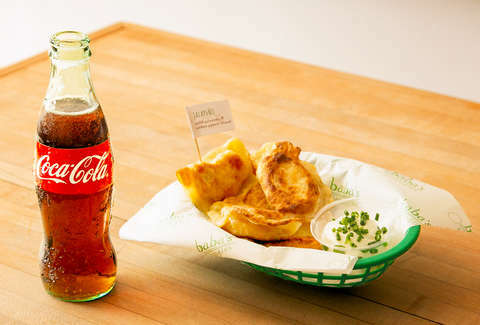 So it’s hardly a surprise that a dish at Baba’s Pierogies -- Helena Fabiankovic’s tribute to her Slovakian grandma Julia -- encapsulates Brooklyn from the Mexican deliciousness of adjacent Sunset Park to the Polish borders of Greenpoint above. In the great melting pot of Brooklyn, Baba's provides a dish for all seasons and nations. The jalapeño makes the pierogies unusually picante, while giving everyone's favorite hot pepper a denser home than the hot weather fare that usually hosts it. It's the perfect comfort food for both NYC's brutal winters and insufferably steamy summers. Is this everything right with America, or what? Travel throughout New Jersey (heck, travel just through Manasquan) and you’ll find plenty of “red sauce” joints (or gravy, depending on whose grandma you’re asking) serving dinner worthy of Sundays with the Sopranos. 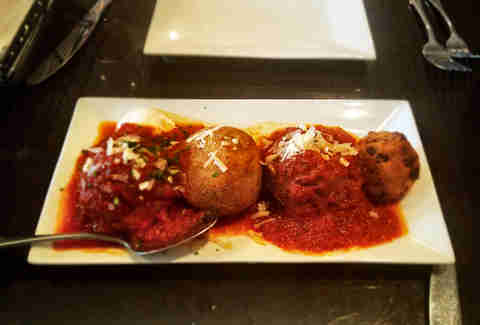 But you’ll be hard-pressed to find the variety of the the sampler at Grandma’s Meatball. Opened just this summer by a brother and sister in homage to their grandmother’s recipes, the restaurant offers four “meatballs”: the first is a classic, traditional beef, veal, and pork meatball, accompanied by a riceball, and even an eggplant “meatball.” But the real innovation is the one made with pine nuts and golden raisins, importing a Sicilian recipe that hasn’t gotten much play in the States till now. It’s all served with a big scoop of ricotta for an extra twist. 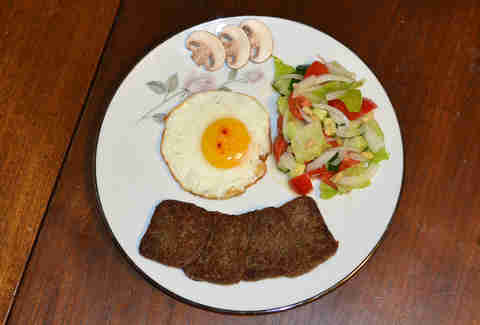 If we’re being honest, scrapple doesn’t sound like it should be delicious. But hey, neither does pâté -- and that’s kind of what scrapple is. Made from “scrap” parts like pork liver, stock, and hearts (yep), and combined with cornmeal, salt, and spices, scrapple was invented by the Pennsylvania Dutch to extend their livestock supply so families were fed through the winter. "Scrapple is and was a byproduct of the nose-to-tail movement (or whole animal butchery) before either of those buzzwords were cool,” says Amy Strauss, author of Pennsylvania Scrapple: A Delectable History. As chefs around Pennsylvania and Delaware experiment with whole animal butchery, a slew of “artisan” scrapples have appeared. Russian Pepper USA’s version is made with mushrooms, polenta, and buckwheat flour, and through extensive research, the speciality food purveyor went above and beyond to mimic the taste of classic pork scrapple by scouting old Amish cookbooks for potential recipes. That makes this version both a tribute and a hot take, wrapped up in one umami-filled package. The same classic seafood joints in Baltimore that gave the East Coast the crab cake are also the eateries that developed the crab “fluff” -- a Maryland delicacy that few people (outside of locals) even know exist. It’s essentially a deep-fried crab cake, but at L.P. Steamers, they take the concept a step further. Maryland Blue Crab is dipped in a funnel cake batter and deep fried into one massive piece of fried deliciousness. Then it’s served with saltines, just how the locals like it. L.P.’s has been around for more than 20 years, and in that time, become one of the most popular eateries in Baltimore with traditional and innovative options both available, so you can have your (crab) cake and eat fluff, too. 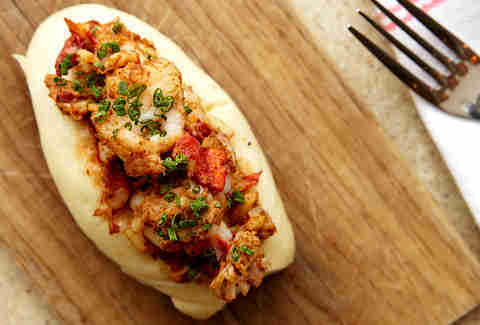 If you’re going to update something as quintessentially Maine as a lobster roll, you have to be willing to take a risk. That’s what Eventide Oyster Co. did when they introduced their signature Brown Butter Lobster Roll. Instead of using a New England-style hot dog bun (split on the top instead of the sides) like most, this uses a slightly sweet, steamed Chinese bao. But the differences don’t end there. On a regular lobster roll, Maine favors mayo rather than Connecticut-style simple melted butter, but here, the chunks of succulent meat are covered in a rich browned butter vinaigrette -- made by cooking powdered milk with unsalted butter until it turns golden brown for delicious nuance. The twist has taken Eventide out of the the great lobster roll debate (butter vs. mayo is old news), and instead sparked a new one. Of course, whether critics agree with the signature bao or not, the press has ushered this update into regional icon status. In a city that has everything, sometimes just being the first person to import a food makes you an innovator -- especially when you’re audacious enough to remix that city’s favorite dish. Even if you know nothing about New York, you know how important pizza is to the local culture. Every New Yorker has an opinion, and everyone has a favorite -- which made it even more impressive when this St. Louis-style pizza joint crept its way into the heart (and stomach) of this great city. Unlike a typical NYC slice, which uses classic fresh mozzarella cheese, a Speedy Romeo pie switches to Provel cheese, a mixture of Cheddar, Swiss, and provolone with a cult-like following in St. Louis thanks to family-owned chain Imo’s. The somewhat salty “cheese-like substance,” as many professionals might call it, is comparable to Velveeta and melts without being droopy or messy. In St. Louis, Provel is simply a way of life -- and in 2012, Speedy Romeo owner Justin Bazdarich decided it was time to make it part of the New York life. With locations in Clinton Hill, Brooklyn, and Manhattan’s Lower East Side, Speedy Romeo serves a beloved St. Louie pie (San Marzano tomato sauce, Provel, Italian sausage, pepperoni, and pickled chilies). Take one bite and watch everything you thought about pizza fly out the wood-fired oven. As they are with any tradition, New Yorkers are picky about pastrami. 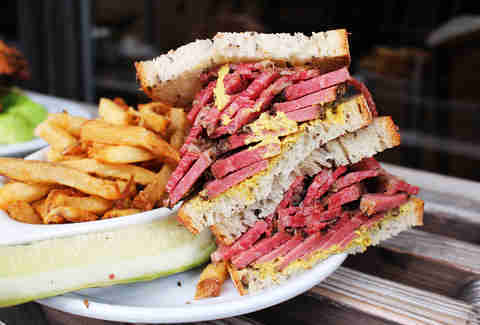 Before Montreal-born Mile End came along in 2010 to spice things up (with actual spices), New Yorkers had been eating traditional pastrami sandwiches from Katz’s (est. 1888) and Liebman’s (est. 1953) for over 100 years. What is a traditional pastrami sandwich? Historically, one that’s made from the navel and seasoned with a rub of coriander, black pepper, and usually sugar before curing and piling high on rye. Pastrami enthusiasts swear -- or swore -- this was the only “right” way to make such a sandwich. Enter: Mile End. Although cured very similar to pastrami, smoked meat is made with brisket. In comparison to pastrami’s origins at the navel -- which is marbled with fat -- this cut is much more lean. And rub-wise, well, you’ll almost never find sugar on smoked meat; just 19 days of curing, smoking, and careful presentation. New Yorkers can be picky about pastrami, sure, but they’ll never complain when something tastes this good. In Vermont, maple syrup reigns supreme. In fact, forget money. The currency in this Northeast region is sap. But while most are content eating the sweet syrup as is -- be it on pancakes or spread out over ice (a delicacy known as “Sugar on Snow”) -- Canteen Creemee has found a way to infuse maple flavor into every ounce of their dessert, "The Bad Larry." Owner Charlie Menard says the impressive structure starts with a cone filled with just a little maple syrup. 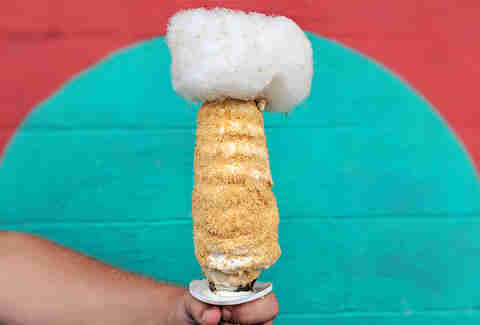 Next, add “a huge tall tower” of maple creemee (soft-serve ice cream) and maple cotton candy on top. Add in some maple crystals, more maple syrup, then roll the cone in crushed maple leaf cookies for an added crunch. Who’s Larry and why’s he so bad? The slang term is generally reserved for something savory or particularly desirable. “Some kids were working and they’d refer to everything as a ‘Bad Larry,’ ” Menard says. “The name just stuck.” And so did the sundae. Canteen’s menu rotates, but the Bad Larry hasn’t left since the creamery opened three years ago. In just four years, Mole Poblano has racked up a reputation for the best tamales in the city -- but this entry is about the Philly cheesesteak, originally created by the city’s Italian immigrants in the 1930s. At Mole Poblano, the bistec con queso tacos are a worthy homage -- a simple beef and cheese taco that’s essentially a Mexican cheesesteak, if you ask the locals. This goes deeper than ingredients, though: Creators Papá Pedro Ríos, and his wife, Ynes Sandoval, got their start in the city by selling the tamales to construction workers, then went “legit” by opening the restaurant on 9th Street in the Italian Market. While it was once home to Italian immigrants, today, it’s become a block full of Mexican specialities thanks to its new residents. The bistec con queso is a simple take, but it shows how this neighborhood (and America) develops based on who calls it home, and how traditions have long-reaching influence. If that’s not brotherly love, we don’t know what is.